Visit with a famous melon producer, Chef and herb specialist with a cooking demonstration and lunch. Visit a private garden focused on floral alchemy. Olive oil tasting of best olive in Provence. In Ansouis, an exclusive visit of thRenaissance castle and its French gardens. A class with a perfume expert in her laboratory in one of the most famous perfume factories of Grasse. Visit a unique private garden named Fort France. This “colorful and tasty” program has been designed especially for Cultural Crossroads travelers who are particularly interested in discovering the secrets of French cuisine and some of the most interesting gardens including many private gardens not normally opened to the public. Cultural Crossroads travelers will enjoy a cooking demonstration by a well-known Chef, wine and olive oil tastings, and a private visit to a Renaissance castle which is now a private residence. We also visit a workshop that creates Provencal fabrics, a glass blowing museum, the impressive estate and winery of Val Joanis, and a class with a perfume expert in her laboratory in one of the most famous perfume factories of Grasse. Of course, every day will include local French cuisine. No reviews yet for this trip. Browse other reviews below for Cultural Crossroads. Morning arrival at Paris’ Charles DeGaulle airport where we catch our connecting flight to Marseilles Provence airport. There, we will be met by our guide. We then transfer to our hotel located in Lourmarin and have a relaxing lunch. Enjoy a leisurely walk to discover the charming village of Lourmarin, our home for the next four nights. We begin our garden discovery with a half-hour drive to the impressive estate and winery of Val Joanis, a remarkable site because of its amazing terrace gardens where flowers and vegetables are mixed. This English-style garden was created by a French lady who was trained as a botanist in England. Enjoy a wine-tasting before going back to the hotel for a delicious welcome dinner. Overnight at our hotel in Lourmarin. After a brief stop at the colorful weekly market of the village of Cadenet, we spend the morning in the town of Cavaillon visiting a famous melon producer and an herb specialist. Under the guidance of this well-known and excellent Chef, he will introduce us to his preferred providers. A cooking demonstration of one of his recipes will be followed with lunch in his restaurant. In the afternoon, a scenic drive to the Alpilles will take us to a private garden focused on floral alchemy. Stop en route in an olive oil mill and taste the best olive in Provence. We will visit the sites painted by Van Gogh in Saint Remy de Provence. We then continue on to a workshop that creates provencal fabrics. From there we visit the impressive Roman remains les Antiques, the clinic where Van Gogh stayed in Saint Paul de Mausole, and the perched fiefdom of Les Baux, known in the 14th century as a brilliant center of the Courts of Love. Dinner will be at the restaurant le Bistrot de Lourmarin. Overnight in Lourmarin. This day is dedicated to Aix-en-Provence and its surroundings with the famous mountain Ste Victoire, immortalized by painter Paul Cezanne. Walk to the Pavillon Vendôme, a beautiful 17th century villa with a French garden. Stroll through the streets of old Aix en Provence in the steps of Paul Cézanne and enjoy the quaint narrow streets and the many elegant mansions. We cannot miss the delightful street market for the pleasure of our senses! Enjoy a brief visit to the Cathedral St Sauveur known for its exceptional variety of architectural styles (from Roman to 18th century), its carved wooden doors and its Romanesque cloisters. Lunch at leisure in one of the many cafes and restaurants along the Cours Mirabeau, or in one of the many streets in the old town. In the afternoon, we will visit Cezanne’s studio at les Lauves where the artist spent everyday of his last four years. Between two paintings of the Sainte-Victoire, he painted a portrait of his gardener, Vallier, under the lime tree. It was his last piece of work, which became his pictorial testament. 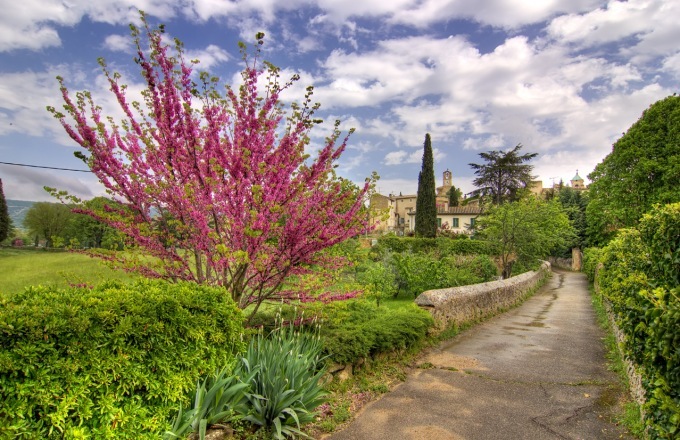 Follow the famous Route de Cezanne to view the sites painted by the artist (Château Noir, Le Tholonet, Beaurecueil, the Pont des Trois Sautets) Return to Lourmarin. Dinner at leisure and overnight in Lourmarin. Today is dedicated to more secret gardens and more lovely perched villages in the Luberon. Begin with the picturesque hilltop village of Ansouis for an exclusive visit of the Renaissance castle and its French gardens. This castle is inhabited by the owners who will guide us through their private residence and treat us to a lovely visit of the château. Continue to Roussillon where we will have lunch at leisure. Take time to walk through the spectacular ochre quarries and wander along the quaint streets of the old village. Stop in Gordes to view this famous perched village. Continue to Bonnieux, one of the most spectacular sites of the Luberon, where we will visit a private garden, closed to the general public. It was created on a rocky terrace by the late Nicole de Vesian. Dinner at the hotel. Overnight in Lourmarin. Check out of the hotel after breakfast and drive towards the Riviera. Stop in Saint-Maximin for lunch in the cloister converted into a restaurant. Continue toward Mougins. Before arriving in Mougins, stop at the foot of the village of Biot on the site of the glass factory. The Eco-Museum introduces us into a journey to the world of glass blowers. We will follow the various stages of contemporary creation in glass making from sand to the final object. Arrive in Mougins in the afternoon and check into our hotel. Dinner and overnight at our hotel. Today begins with a visit to Grasse, the famous town of perfumes. Enjoy a class with a perfume expert in her laboratory in one of the most famous perfume factories of Grasse. Continue to visit a unique private garden named Fort France. The land was purchased to build a villa in 1930 by Lady Fortescue, a British writer who became famous with her best seller "Perfume of Provence". The garden changed hands over the years and has become the property and work of art of painter Valérie. She shows her deep sense of harmony with a creative and subtle mix of colors. It is a dream to discover a variety of Mediterranean species: the romantic mimosas, the pink oleanders, the banxia roses covering the cypress trees, the justicia, the blue, pink and white wisterias, the velvet red of the bignone buccinatoris. Lunch at a gourmet restaurant. In the afternoon, we will visit another extraordinary private garden, La Bouscarela, hosted by the owners. Dinner and overnight in Mougins. Morning in Nice we will visit the flower market. Our panoramic tour of Nice includes the Matisse Museum, the Belle Epoque luxurious residences, the Russian Church, the exotic garden and the hills of Cimiez and its Franciscan monastery. Meet with a famous chef and enjoy a cooking demonstration at his restaurant. Lunch together hosted by the chef. Drive to the lovely seaside resort of Menton, known for its numerous public and private gardens. Visit La Serre de la Madone (recently purchased by the Conservatoire du Littoral and being permanently restored). Under the guidance of the head gardener, we will stroll with delight through this lush park with exceptional tropical plants and many patios and courtyards. Farewell dinner in and overnight in Mougins. Private transfer to Nice airport after breakfast for flight to Paris. Connect to outgoing flights unless you are staying for a three day optional post tour in Paris. Visit to a private garden focused on floral alchemy. Personal expenses such as excess or overweight baggage charges, laundry, telephone, Fax, E-mail charges, room service. Cancellations within 14 days of booking (if not within final payment date): full refund. Cancellations after 14 days of booking: $1000 retained (entire deposit). Final payment due: 90 days before departure. Cancellations made less than 90 days prior to departure: no refund. Cancellation by Cultural Crossroads: full refund. No refund for unused portions of the tour, including but not limited to, missed meals, hotel nights, sightseeing, or changes in arrival or departure..